We made it! This is the last segment of voting for the Best of 2016. Ballot 2 and Ballot 1 are still open if you need to revisit or add your votes for the first time. Remember: If you want to be in the running for prizes, you need to have completed all three ballots. We’ve been through some tough choices so far, gang, and let me tell you that what I know of the tallies so far says that you collectively have had a tough time — we’ve had a lot of great stuff to choose from! But now it’s down to brass tacks for some of the most important stuff going. Reader xaneg commented the other day that these last few weeks in 2016 have been an absolute bloodbath of graduations. They have! And worse, they’re really just scratching the surface; 2016 has been riven through with heartbreaking graduations, voluntary and forced and otherwise. Whether it was Teratani Mina and kidney disease knocking her out of Fruitpochette, You’ll Melt More!’s management demoting Chibo and saying sayonara to Mone, Hug Me leaving BiSH to deal with a family emergency, Saki announcing her withdrawal from Guso Drop or long-timers Ayano and Mizuho leaving Bellring Girls Heart to focus on the next steps in their lives, you need to choose which broke your heart the most. We already looked at group debuts, but what individual joined the fray in 2016 and left the biggest mark on you? 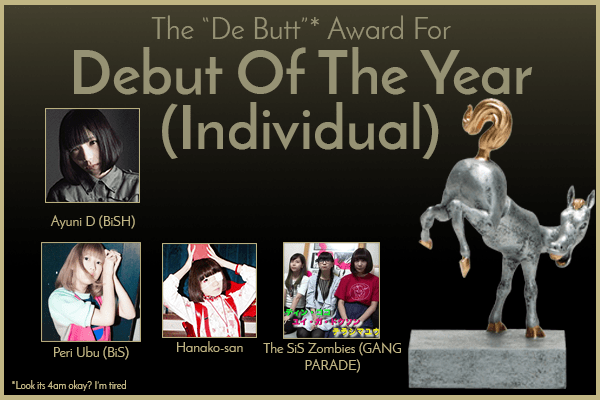 We have Hanako-san being called from her toilet hell to deliver pain more widely to the masses, and a whole WACK contingent of Ayuni D immediately becoming a BiSH favorite, Peri Ubu as an instant attractor in BiS and, following the failed beginning of SiS, the trio of Coco Partin, Yuyu and YuiGD joining GANG PARADE. Here’s where the real individual awards kick in; debuts are nice, but legions of well-earned adoring fans are much nicer. Every woman on this list is an awe-inspiring crusher of limits in her own way, a talent that not only can’t be denied, but commands your attention. The question is, who stood out the most as a dominant performing force in 2016? 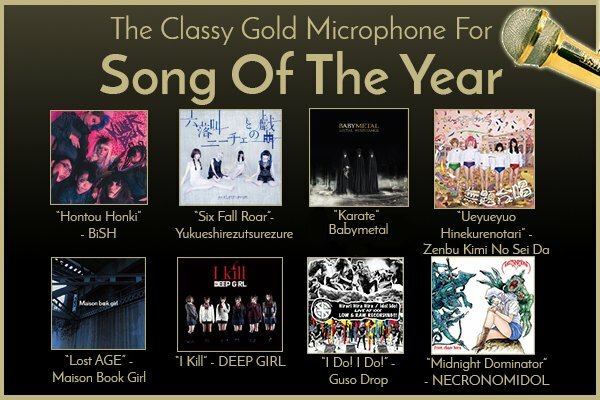 Hanako-san, Yuna from PassCode, Su-Metal, Pikarin Shiina, Aina the End or MAINA from Osaka Shunkashuto? I’d give you a preview list, but if you need one, I’m not sure you should be voting. We’ve had so much great music this year that I’m almost afraid to step ahead into 2017; can it get better, and how much better, and what surprising genre-bursting innovations can we look forward to? Rather than get ahead of ourselves, though, let’s focus on the individual songs that made the biggest mark this year. And yes, you do get a list this time because you won’t twist in the wind enough without hearing a whole string of personal favorites before being asked to choose. This is it. We’ve been able to vote on debut records and B-sides and singles and videos and albums and (right up there!) songs, but who really won 2016? That is, whose year was the most dominant? Who will you remember most? The criteria for this are your own to decide with, but the choices in front of you are tough ones no matter what. Yes, you have to put your email on this one, just one more time. ← Full Power Girls R Go! Pretty much a random toss at every categories because i would actually choose almost every answer each time. I feel I voted with extreme bias this time and I’m fine with it. Looking at it objectively I would vote a little differently, but Idol is just as much about the loyal fans as it is the performers. I had to go with my favorites! The BiSH ballot! Some of these choices were painful. You mentioned Chibo was “demoted” before; where did you see that? The vibe I got from the translated press release tweet (TPRT) was that it was her decision (that sounds naive now that I’m saying it, but) what did you mean by demoted? I hadn’t -and still haven’t- heard of Let’s PocoPoco. I guess that could be seen as a demotion within their agency, with YMM! being their A-team. Stupendous question. That’s actually how the Chibo situation was described to me, that she was being spun off down to LPP, which was brand new at the time and very much the little sister in the company structure. 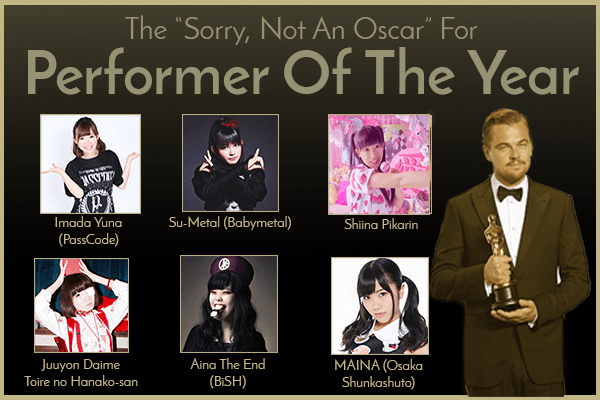 Can I vote for Aina-Metal? If you normally like voting for apocalypses, then yes! How dare you make me choose between Aina and Su??? BABYMETAL is definitely Idols Of The Year. This was their biggest year yet and a really huge year for the idol market to crossover to the foreign/overseas audience (which BM did play a big factor in). The release of a highly anticipated new album (which made records and history in certain music charts), a new professional music video, a world tour and performances on several music festivals, an appearance on The Colbert Show, live shows with the Red Hot Chili Peppers plus upcoming lives with Guns N’ Roses and Metallica in 2017, an animated program in the works with Warner Bros., and all the different awards they have won. Sure they have become the “mainstream” group in the idol genre prompting many people to publicly display their disgust for them and claim they are “not metal” which in turn forces some fans to take it personal and defend them resulting in an all out war on online forums and social media websites. Let’s not forget that this is the same group where so many idol fans got their start and were introduced to the idol genre. BiSH and PassCode also made great steps this year with signing on to major labels but BABYMETAL really made a gigantic leap from where they were in 2015 to where they are now. How is Passcode a j-rock band? now they have there live backing more often and playing shows with other bands, seems some people are viewing them in a different light these days, same can be said for babymetal, how are they a metal band? in all honesty both are idol groups but only those comfortable enough in there love for the idol genre will probably admit that and use the term when introducing those groups to newcomers, others will just call them a ”what ever genre” band in hopes it somehow legitimises them as artists. I like how BiSH solves that problem by calling themselves the punk band without a band. Many idol groups play with bands from time to time, I’m not aware that Passcode do it a lot. 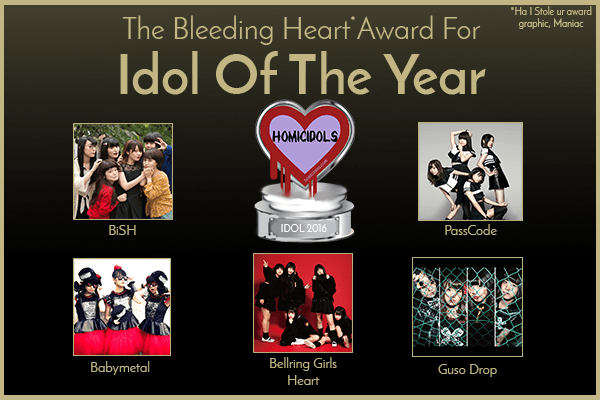 Either way I don’t see Passcode fitting into the j-rock category. As for Babymetal they are not a “band”, they are a 3 person idol group for now, and obviously they are metal. I know this and you know this I wasn’t disagreeing with you xD merely explaining how and why people commonly doit, then again considering PassCode are nearly identical to fear and loathing in Las Vegas almost soundwise and they are j rock, I can definitely hear and understand why people would think it, I just know better that they are infact, an idol group. This is not directed at anyone in particular. God, you all drive me crazy. Who gives a crap about labels? What is this now, a heavy metal forum? Genre labels are stupid and most of the time wrongly used. Just listen and enjoy, or did I somehow end up in some type of OCD clubhouse where everything has to be just so. Actually StraightFromJapan I agree with you, I think people are too caught up with labeling stuff (genres). However there is something that goes beyond that, you can’t call an idol group a band, because they not. That was my only real nitpick. I always look at it this way. A band plays instruments, Idols do not, they are groups. Now, of course this gets nit-picky when you look at a group like BABYMETAL, I consider them an idol group with a rotating live backing band, same with Screaming Sixties (minus the rotating part). I guess the qualifier is this: Can the group do the same thing without the band backing them up? If yes they are a group, if no they are a band. These are the only two labels I really use, besides the label of idol of course. All said and done, Ayumikurikamaki owned this year. Welcome to the will of the community. Editorially, the only thing you cite that hasn’t worked in here is Momoclo, and I honestly stay out of that because they’re an industry unto themselves at this point. But we had nominations open in different ways for well over a month, and nobody brought up Babyraids or Ayukuma (except in the Letdown category). We’re still a young group, and a group that’s largely grown into its interests via certain pathways all together. I bet that next year’s lists look very different from this one, you know? New folks come around all the time. But this just bewilders me. Did these people even watch TIF? I think the Tabidachi no Uta thing turned folks away from Ayukuma, who definitely had a great first 8 months and are getting to be a big deal. Babyraids, there’s just a lower level of awareness, odd for a legitimately big act. I’m surprised at how little reaction their stuff gets when I share it. Yeah that AKM single was quite a boring affair for most of us, definitely neither there catchiest or most energetic work to date, I just didn’t get any fun from it at all, I’m assuming the majority of the community felt the same if no one voted for them despite their excellent record and material overal to date. I like babyraids myself but yeah I guess it’s a little too sweet for some of our tastes or people just don’t pay enough attention enough to them when it matters. Yeah that AKM single was quite a boring affair for most of us, definitely neither there catchiest or most energetic work to date, I just didn’t get any fun from it at all, I’m assuming the majority of the community felt the same if no one voted for them despite their excellent record and material overal to date. I like babyraids myself but yeah I guess it’s a little too sweet for some of our tastes or people just don’t pay enough attention to them when it matters. Because not enough people suggested them! I can’t shake this feeling that I might have voted for Pikarin as performer of the year if I’d paid more attention to her. If I was part of that unworthy horde that got stepped on and bitten at Aomori, I’m sure I would have voted without hesitation. This year ruled. AHH! Maybe aside from the the sweet pop “traditional” Idol, Idol is a performance style, not at all a music genre. Almost all “Popular” music seems to have a similar divide that allows Idol the “win” in the style category, regardless of description of song or some vague unit “genre”. We need some “Style” related category next years, too. 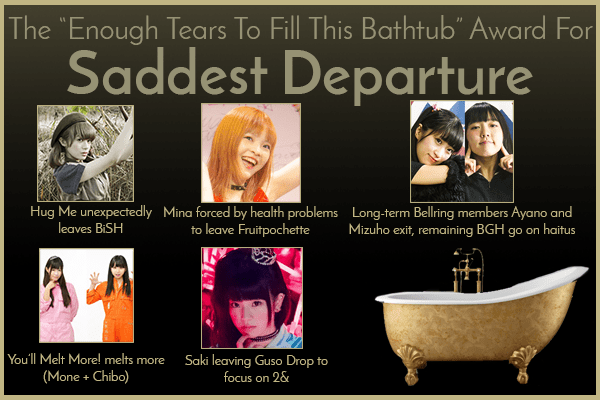 It appears you can add Kanra to that Saddest Departure with Mizuho and Ayano. I saw that this morning! It’s making me wonder exactly what ol’ Bellheart’s going to be doing if/when it comes back. Woah… That shallow grave just got like 600ft deeper. NO PLEASE ANYTHING BUT THAT! Uh, HELLRING debuts real soon. Rebranding BELLRING maybe IDK ? graduation anxiety might be overblown and we’ve all been played (fingers crossed).